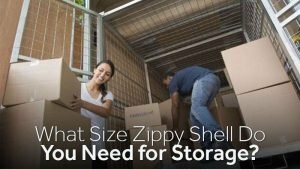 Home / What Size Zippy Shell Do You Need For Storage? Zippy Shell containers provide you with a convenient street-legal alternative to traditional storage. A Shell can be delivered to the place of your choice, as well as picked up and dropped off according to your schedule. Zippy Shells give you exclusive access to your valuables with no drive-ups or passcodes necessary. You get complete freedom to load up a shell at your convenience in a manner that is efficient and safe. The most important consideration you can make when moving is how much storage space you’ll need and we have good news to help the moving process go easier! Zippy Shells can be delivered to you so that you won’t have to make a decision on the spot. This gives you time to calculate exactly how much space you will need, which helps you save time and money by getting the right sized Shell. Zippy Shells are available in two different sizes: 10-foot units and 15-foot units. A 10-foot unit can store up to two rooms worth of items. This would include furniture, boxes and other larger items such as a bicycle. A 15-foot unit can hold between three and four rooms worth of items including furniture and large appliances such as a refrigerator or washer and dryer. Keep in mind that the household items you can fit into a unit will depend on your packing skills and ability to utilize space efficiently. If you prefer to hire a crew to help you, then the moving experts at Zippy Shell can do the moving for you. This ensures that all items are packed securely, and all space is utilized appropriately. 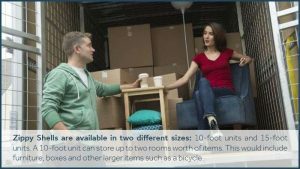 Therefore, if you live in a small apartment with limited items, then you will only need a 10-foot unit. A larger home with lots of furniture and bigger appliances will require a 15-foot unit. When in doubt, it’s always better to have more space than not enough. A Zippy Shell expert can help you calculate the required space if you need assistance. Which Items Should You Store? One of the benefits of renting a Zippy Shell is that you’ll have time to determine which items are going with you in the move and which items you’ll be getting rid of. As you go from room to room, you’ll be able to purge all the stuff you no longer want. It’s a convenient way to store the most important items, and you’ll have more time to make the critical decisions about your valuables. If you are looking for a practical solution for home storage, then contact us at Zippy Shell Greater Columbus today. We offer mobile storage units that arrive on site no matter where you’re moving to or moving from. Call us at 614-915-0800 to request a free quote today.